Europeans in North America tend to focus on the history of the continent since Europeans arrived, glossing over the people and civilisations that were here beforehand. A blog post entitled 'What if people told European history like they told Native American history' sums up the problem rather neatly. I hope that particular tide is on the turn, now, but there is still a lot to learn about the people who used to live here. Last night I went to a fascinating talk by George Reid, who is making valiant efforts to identify the sites of early settlements in Prince Edward County. He is building upon the work of the Reverend Bowen P. Squire, who lived on the north shore of Lake Consecon in the 1950s. An article written by Squire about his findings is available online [PDF] and makes for interesting reading. Squire postulates that this area would have been an easily defensible place to create settlements in and he describes (and illustrates) the site he excavated on his property (which was just a little to the west of ours, I believe). The dam which formed Lake Consecon was built in 1806 - before that, the lake would have been a creek about half the width it is now. The image is from 2009 and the paler field on the middle right of the picture is the hayfield at the rear of our farm (with a triangle of woodland just beneath it). 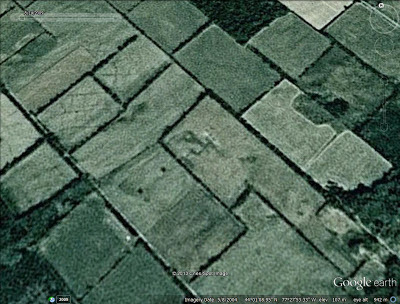 In our neighbours' fields on the left and in the centre you can see dark cross-hatching in one of the fields and some dark shapes which George told us represent an old settlement. The people who lived here were of the Wendat nation (the people dubbed the Huron by French explorers) and George explained that their longhouse settlements were surrounded by palisades and that the whole village would have been moved to a new site periodically once nearby sources of wood for fuel had been exhausted. These villages may have been home to 2,000 people - raising the possibility that the population of the County may have been almost as high then as it is now (around 25,000 people). The Wendat people lived in this area in the period up to around 1525, according to George, and may have been here for 2,000 years. They would have lived on eels and fish from the creek and Weller's Bay, the wild animals they hunted and the food they grew: corn, beans and squash. I was sowing corn and squash on Monday in a small ploughed-up part of the hayfield in that satellite image. I now wonder if 500 or 1,000 years ago a Wendat woman might have been doing exactly the same thing in exactly the same place. The line I'm thinking of is the one that divides behaviour that is considered quite normal, and behaviour which is viewed as eccentric. The location of the line varies from person to person, of course, and I'm fairly sure that a lot of things I consider perfectly reasonable activities would definitely be on the other side of the eccentricity line for other people. Growing my own food, raising chickens, baking all my own bread, making granola, refusing to buy processed food - that sort of thing. But I crossed my own version of that line in recent months when I started making my own yog(h)urt. I don't know why that seems more eccentric than baking bread (and the two activities are now closely linked, as I'll explain in a minute), but it does. Somehow making yoghurt seems such a 1970s thing to do. But it's so easy that I've become completely addicted to the process and always have a batch of home-made yoghurt in the fridge. I've delayed blogging about it because of my reservations about it being an odd sort of thing to do. The initial stimulus for the activity involves another confession (you can see why I delayed writing this post). I'm really bad at throwing out man-made containers like jam jars and yoghurt pots. I have cupboards full of them and they do come in very handy at times, but I really don't need any more. When I read Mimi Spencer's book 101 Things To Do Before You Diet back in February and she explained how simple it was, I was inspired to give it a go. And now I've been re-using the same yoghurt pot for the last three months. Win! I started out by ordering a sachet of yoghurt culture online. You can just buy a jar of plain active yoghurt as your starter culture and don't need to do this, but I didn't have any to hand at the time. Then you heat some milk to boiling point (I use 2% fat milk) and let it cool down to about 45°C/115°F (if you don't have a thermometer, I read somewhere that at this temperature you should be able to keep your finger in the milk for 20 seconds). Stir three tablespoons of the yoghurt into the warm milk and then pour it into a vacuum flask (at the start of the process I just fill the flask with milk to measure the quantity - hence the lack of precision in these instructions! [I've now measured the quantity and my flask holds a litre/quart of milk]). After a couple of hours the milk will have curdled and you can strain the yoghurt to remove the liquid whey and thicken it up. I use a sieve lined with a coffee filter paper or kitchen paper for this. Here's the view from the side. You can see the whey underneath the sieve. I use the whey as part of the liquid I add to my bread - which means that a yoghurt-making day is usually also a bread-making day. But I've also read that tomato plants really like the calcium in whey, so I might use it for that in the summer. Tonight I'm planning to use the yoghurt to make naan bread and raita to accompany the curry we're having for supper. My stomach is already growling at the thought. So, do you do anything that you feel crosses your personal eccentricity line? Or is it just me that worries about these things?